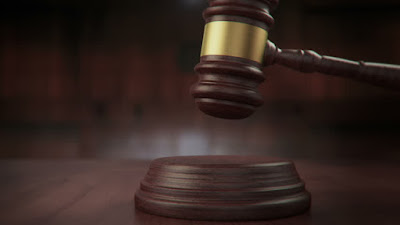 In a well-coordinated sequence of filings in the Bankruptcy Court, Thomson-Shore revealed that a sale of essentially all of its assets was already well under way with a preferred buyer. In what’s known as a “363 Sale” (based on the section of the U.S. Bankruptcy Code that permits the sale of assets free-and-clear of past claims and liens in a bankruptcy proceeding) Thomson-Shore has designated the CJK Group as its “stalking horse” bidder, the company it had selected to be in the preferred starting position in the 363 sale process. With a clear head start and advance planning, CJK is the company most likely to win the race to acquire Thomson-Shore’s assets. Book printing industry consolidator CJK Group had solidified its position in advance of the bankruptcy filing by lending $760,000 to Thomson-Shore on March 1st as a pre-petition secured loan. That loan likely extended the life of Thomson-Shore and afforded CJK the time needed to develop a solid plan to buy the company on its own terms. To further support the company as it works though the bankruptcy process, CJK also provided $500,000 of DIP financing to Thomson-Shore within days of the bankruptcy filing (DIP stands for Debtor-in-Possession; a DIP loan is a form of financing afforded administrative superpriority over other claims in bankruptcy). As a secured lender and now also the DIP lender, CJK is in the position to include the face value of its secured loans as a “credit bid” included in the final price paid for the Thomson-Shore assets. 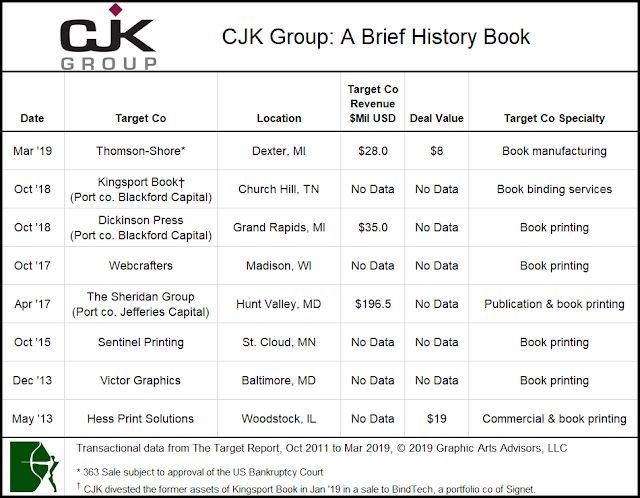 In other words, CJK has already made a significant down payment towards its plan to purchase the Michigan book printer. Salem One, a diversified printing and graphic services company in Winston-Salem, North Carolina, acquired Postmark. The purchased company, described as a “full-service direct marketing company,” clearly has its roots in the lettershop business, offering postal presorting, addressing, inserting and data hygiene services, with a smattering of upstream design and marketing services. These acquisitions, as well as other similar deals, reflect a growing industry trend toward firms providing a full roster of services rather than focusing on one or two capabilities. As more and more printers add mailing services, and mailing service providers add digital printing capabilities, a convergence is occurring. We expect this trend to continue. Publicly traded printing company Ennis, with a highly diverse product offering sold exclusively through distributor channels, acquired Integrated Print & Graphics, based in South Elgin, Illinois.‡ The acquired company shares corporate DNA with Ennis, as both companies were originally established as manufacturers of business forms sold through independent distributors. * Graphic Arts Advisors, publisher of The Target Report, served as exclusive advisors to Direct Mail Solutions in this transaction. †Graphic Arts Advisors, publisher of The Target Report, served as exclusive advisors to CL Graphics, one of the companies that was acquired by and is now part of Integrated Print & Graphics. ‡Graphic Arts Advisors, publisher of The Target Report, served as exclusive advisors to Maestro Media Print Solutions, one of the companies that was acquired by and is now part of IBS Direct.